It can be easy to overlook the tiny South American nation of Ecuador. 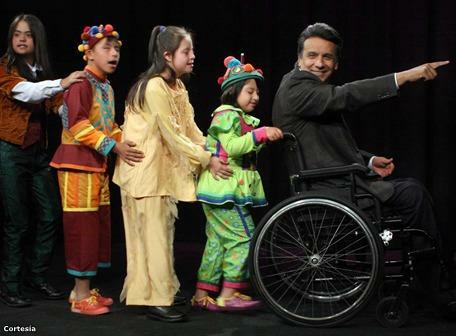 Yet Ecuador stands out as one of the region’s most advanced countries for disabled people. A major force behind this effort is Lenin Moreno, Ecuador’s vice president. A paraplegic, Moreno is one of the world’s highest-ranking leaders using a wheelchair. Lenin Moreno was once a wealthy businessman and politician. But in 1998, he was shot in the back as gunmen stole his car from a parking lot in Quito. He was paralyzed from the waist down. Moreno overcame intense pain and bouts of depression to become a motivational speaker. He’s written books about the healing power of laughter. He also performs inspirational songs. In 2006, Moreno was elected vice president. At the time, it was rare to see people in wheelchairs in public. In rural areas, people with severe handicaps were treated as outcasts and sometimes confined to sheds and chicken coops. But Moreno has tried to change all that. Wheelchair ramps are springing up across Ecuador. People with severe disabilities now receive $300 monthly stipends from the government. And Moreno helped draw up a law that compels Ecuadorian companies to set aside at least 4 percent of jobs for people with disabilities. In a recent speech, he pledged that the government would reach out to all disabled people who need help. That, he said, amounts to a revolution. That revolution includes providing free artificial limbs to poor Ecuadorians. Some are being built in a wing of this state-run hospital in Quito. Government officials say the program is the only one of its kind in Latin America. Jorge Costa, who manages the project, says thousands of Ecuadorians hobble around on crutches because they’re too poor to buy artificial limbs. Now, he says, they can become productive members of society. One person who has made this transition is Sarita Carlosama. I meet her at a sports club where she’s playing an early-morning game of wheelchair tennis before going to work. A disease affecting her spinal cord left Carlosama paraplegic 20 years ago. Back then she was studying to be a doctor. But she had to quit because there was no wheelchair access to the fifth-floor classrooms. Finding a job was tough. But under the new law to bring disabled people into the work force, Carlosama was recently hired by an oil company. Not surprisingly, she’s full of praise for Moreno. At the presidential palace where Moreno has his office, disabled people line up every morning seeking assistance. Upstairs, Moreno’s top aide, Alex Camacho, says other Latin American governments have called on Ecuador for advice on policies for disabled people. “That’s why we are now advising to Peru, to Bogota, to Uruguay, to Dominican Republic, to Guatemala, also to Haiti,” Camacho says. The presidential band plays as foreign diplomats present their credentials to Moreno. He’s now Ecuador’s acting president, because President Rafael Correa has taken a leave of absence to campaign for reelection later this month. But Moreno is not on the ballot. He says he needs a break from the exhausting schedule. Still, many of the programs Moreno put in place are likely to continue, says Monica Alemeida, an editor at El Universo newspaper. It seems likely that Ecuadorians will see more of Moreno. He was nominated last year for the Nobel Peace Prize. And there’s speculation he will run for president in 2017. Kentucky amputee appears on "Hawaii Five-0"